David Villa has been sent off after the referee was able to review footage of him punching an opponent, although it caused a break of nearly four minutes in the game. 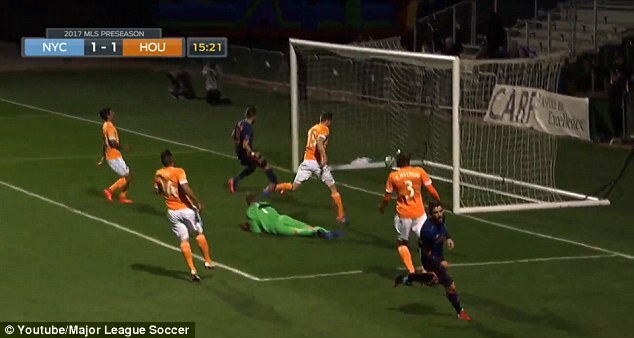 Former Valencia and Barcelona striker Villa, who now plays for New York City FC, was playing in the pre-season Desert Diamond Cup game against fellow MLS side Houston Dynamo. With the game poised at 1-1 – Villa having equalised for New York – he threw a punch at Dynamo midfielder AJ DeLaGarza during a tussle as Andrea Pirlo took a corner in the 37th minute. 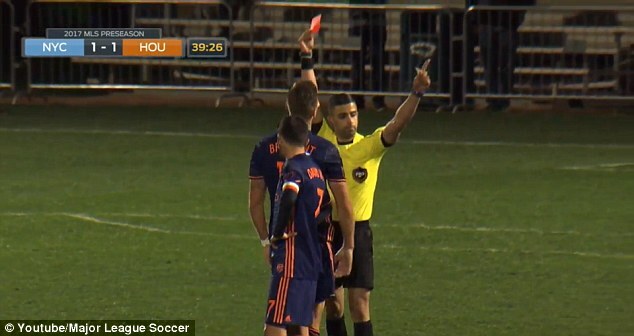 Referee Nima Saghafi immediately blew for a foul, and after a brief tussle between the players subsided, booked the former Spain international. 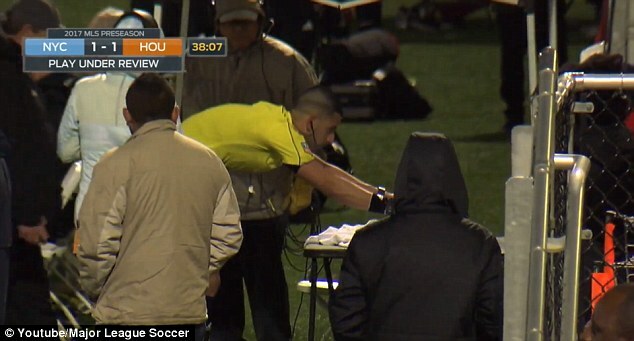 However Saghafi seemed to suddenly remember that he had the technology available – the video assistant referee (VAR), which has been used in the MLS reserve leagues since the start of last season, and was also used in the FIFA Club World Cup last December. He ran to the touchline, where a monitor clearly showed Villa striking DeLaGarza in the face. Saghafi then reversed his decision and red-carded Villa, incensing him and his team-mates, resulting in another minor brawl on the pitch. 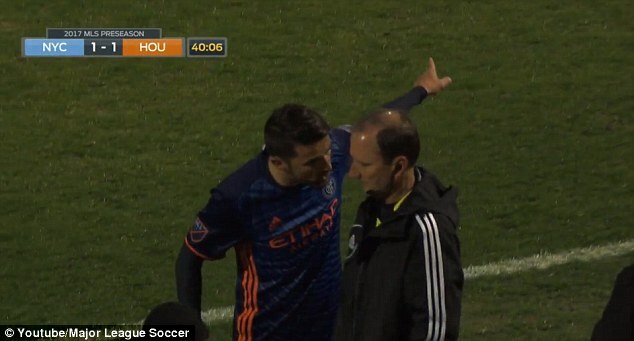 36:54 – David Villa punches Houston Dynamo player AJ DeLaGarza following an Andrea Pirlo corner. Referee Nima Saghafi blows whistle. 37:17 – After a small tussle, Villa is eventually booked. 37:54 – A full minute after the initial incident, referee Saghafi decides to call for a video review. 38:10 – Saghafi views incident on computer screen by the side of the pitch. 39:26 – Saghafi reverses his decision and sends Villa off. 40:38 – After Villa eventually leaves the pitch, play resumes. Villa eventually exited the pitch and the game resumed – three minutes and 44 seconds after the initial foul happened and the game was stopped. The delay to play for the use of VAR will be used as further evidence by critics that overuse of technology in decision making slows football down too much and can lead to refereeing inconsistencies. It is in stark contrast to the speed and efficiency of goal-line technology, which has been proved a fast and reliable arbiter in showing whether the ball has crossed the line, as shown in Saturday’s FA Cup fifth round tie between Burnley and Lincoln City. However the correct decision was eventually made, as Villa was clearly shown to have hit DeLaGarza in the face. VAR can only be used by referees for what the MLS describe on their website as ‘game-changing’ decisions: specifically goals, penalty decisions, direct red card incidents, and cases of mistaken identity. Houston took full advantage of the extra man, and went on to win the game 3-1.